Thank you for sharing this. 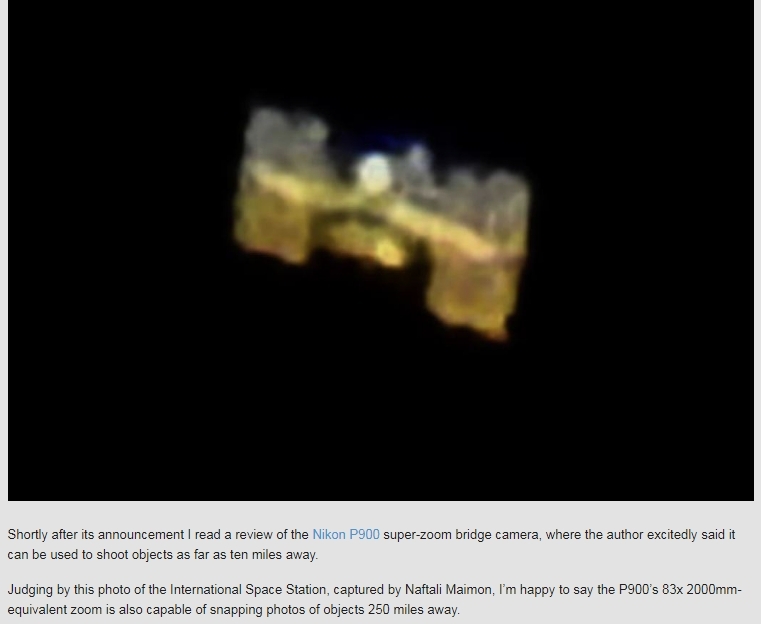 If at 67x zoom this object was so difficult to track that you couldn't even make out it's "H" shape definitely, then what chance would there really be for anyone to take a picture of it at a much greater magnification to get the detailed amateur shots we find scattered throughout the internet. So, based on your report it seems that that the "H" shape may to be an actual feature of this object, but the authenticity of the close-up amateur photography has become more doubtful. Oops - the night after tomorrow actually. November 29th. So I originally planned to use a longer exposure, like 15-20 seconds, but because it was still not totally dark my test shots looked much too bright so I cut it back to a 10 second exposure. I also used a wide angle instead of 70mm because it wasn't yet dark enough to see more than 1 or 2 stars so I wasn't sure where exactly in the sky the camera was pointing when I set it on the tripod. The chart was extremely accurate. There's some barrel distortion in my image resulting from the wide field of view, plus whatever sphere projection distortions are in the charts, but the location of the path between the stars matches. 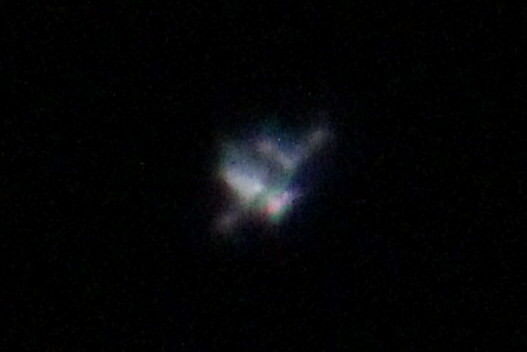 The_White_Lodge » November 27th, 2017, 7:43 pm wrote: If at 67x zoom this object was so difficult to track that you couldn't even make out it's "H" shape definitely, then what chance would there really be for anyone to take a picture of it at a much greater magnification to get the detailed amateur shots we find scattered throughout the internet. You only need to catch it in frame very briefly to produce such shots. It's actually a lot easier for a high speed shutter to get a good image than it is to view it directly through the scope. Most of the pics I've seen used shutter speeds of at least 1/1000 second, which would produce a sharp picture of something that was only a blur to the eyes. My plan is to use the camera in video mode with 1/1000 shutter and ISO 6400. Rather than trying to track the thing through the telescope's narrow field of view, I'm going to follow it using the attached finder-scope which has a red-dot reticle aligned with the telescope's field of view. I'm also going to loosen the nut on the telescope mount's altitude axis so the scope swivels very smooth and loose, which is something I wouldn't ordinarily do when I'm looking through the eyepiece.  Then all I have to do is try my best to keep the red-dot reticle on the ISS as it makes it's pass. I'll be looking through a much larger field of view than the telescope/camera so corrections will be much easier. As long as I get it in the frame at least once during the minute or so it will be high in the sky and closest (as opposed to near the horizon), and assuming the exposure settings will work to get enough light for it to be seen, I should be able to get an image that resolves to some sort of shape. This is what I hope to accomplish on the 29th. I must admit this plan does seem like it could produce a decent image if carried out with a sufficient level of skill. It is looking like I may soon have to concede that this object does have this ridiculous shape and design that the amateur photography suggests, which if true is entirely unexplainable to me. The drag factor alone would seem to make the sustained orbit of such an object impossible, not to mention the question of how it got in orbit in the first place and how it hasn't been destroyed or heavily damaged by some piece of debris crossing its path. Then there is perhaps the most pressing question of all, which is what is this object's actual purpose? If the technological means exists to accomplish such a feat, then certainly we should not be naive enough to suggest that the sole purpose of such effort would be to give a small light show to hypnotized slaves one minute a night so that they're slightly less likely to wake up. 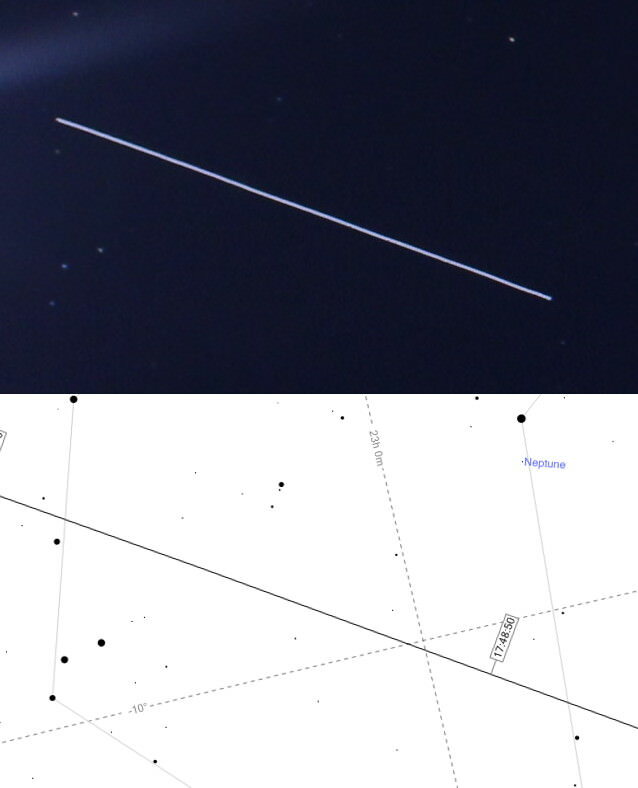 Wow I just saw the "ISS", this evening for the first time, or I should say I actively searched for and saw it. Honestly I've probably witnessed it many times before and just didn't know because it looks so similar to a night plane or something. Didn't see flashing lights or hear any sounds though. One thing bothered me though when it came down out of sight. It stayed a pure white the entire time. I expected when it got lower, it would gradually start turning shades of yellow or orange like the sun or moon at setting time but nope. It just faded out near the horizon. I don't know what that could mean but it seemed a little odd to me. There was another pass tonight that I didn't originally plan on trying to photograph due to it being less bright (-2.7) than tomorrow's predicted -3.6. I decided to go ahead and try getting some shots with just the telescope and camera (no eyepiece). So basically the telescope was like a 600mm zoom lens - equivalent to 12x magnification. I wanted to see if settings of 1/1000 second shutter speed with ISO 3200 would work at that level to at least create a visible image - which it did! I was able to zoom in on the resulting images enough to see a sort of shape, but of course its way too pixelated to show any detail. Bear in mind these were only taken at 12x magnification and then enlarged. I'm still going to move forward with the plans for 67x magnification photos tomorrow night (or whenever the next clear night with a good pass will be if its cloudy tomorrow). However I think I will try to use the camera in photo mode instead of video. The reason being is that video resolution is only 2 megapixels (1080x1920) while photos are 18 megapixels (5184x3456). And with the method of aiming through the finder-scope while blindly firing the shutter, as the pics above were produced, I should get it in frame a few times. I may also try a faster shutter speed like 1/2000, but I'm still mulling that over. I agree that the finder-scope-picture-plan is superior to video mode which with that resolution will probably only give you another series of blurry dots. agraposo » November 18th, 2017, 6:40 am wrote: I'm wondering how some basic trigonometric calculations can demonstrate in any way that some light point crossing the sky is situated 400 km away or wherever. The object paths seen in the charts are independent of the distance of the object. No, they are not independent of the object's altitude. All you have to do is check the path given for locations that are at various distances in a line perpendicular to the path. I say that the object's path against the background stars for a given fixed location is independent of the object's distance. For location A the path will be P(A). For another location B, the path will be P(B), different than P(A). But P(A) is independent of the object's distance, and P(B) is independent of the object's distance. The object's distance can be calculated comparing P(A) and P(B) at the same time. Have you done this calculation, as a practical example, without resorting to Heavens Above charts? NotRappaport » 19 Nov 2017, 01:33 wrote: To illustrate this, lets use a pass not too far from Simon's part of Italy that will take place on 01-Dec. I respond myself. I've done the experiment for my location (Madrid) today at 6:57 pm with a friend located 20 km apart. From both locations we saw the light near the zenith at the same time. This confirms the charts and the explanations given by NotRappaport. The_White_Lodge » November 29th, 2017, 7:35 am wrote: I agree that the finder-scope-picture-plan is superior to video mode which with that resolution will probably only give you another series of blurry dots. That was my thought as well - with video the resolution would be not much better than the photo resolution at much lower magnification. 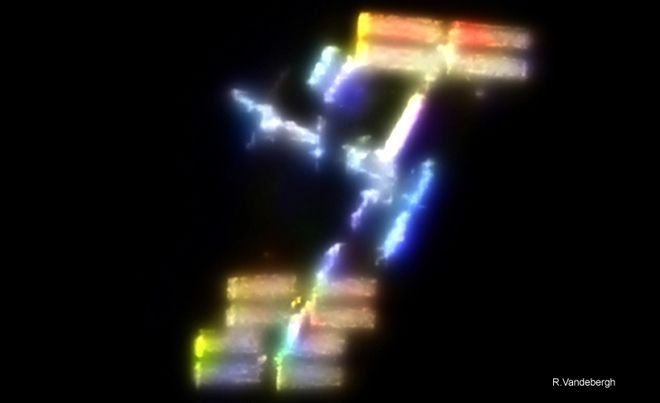 Although even at 12x many of the pixelated images do seem to reveal what could be a faint "solar array" structure. Skies are clear now, and even though its only early afternoon it looks like tonight will be good! I've decided on sticking with the 1/1000 second shutter speed for most of the pass, however I can adjust this on the fly so for the brightest part overhead I may try increasing it. Aiming through the finder scope I was able to get it in 100% of the images at 12x magnification, which is a field of view of about 2°. When using the 9mm eyepiece (which ordinarily produces 67x magnification) the field of view the camera sees is about 0.3°. To put these fields of view into perspective, the image below represents the field of view at 12x magnification.  All the little white dots are the various places within the frame that the "ISS" was captured. The white rectangle is approximately the 0.3° size of the field of view the camera will see when using the 9mm eyepiece. Given this limitation a lot of the pictures will fail to capture the thing. But perhaps 1 out of 5 will be in-frame - and since I plan to snap at least 50 pictures during the pass, I should get a nice selection of visible shots. Nathan Draco » November 28th, 2017, 5:05 pm wrote: One thing bothered me though when it came down out of sight. It stayed a pure white the entire time. I expected when it got lower, it would gradually start turning shades of yellow or orange like the sun or moon at setting time but nope. It just faded out near the horizon. agraposo » November 29th, 2017, 1:52 pm wrote: I've done the experiment for my location (Madrid) today at 6:57 pm with a friend located 20 km apart. From both locations we saw the light near the zenith at the same time. Thank you for setting up that test and reporting your first-hand observation! Ok, I took a total of 261 pictures of this pass and it looks like my estimate of it being in frame 1 out of 5 times is about right. Out of the few dozen pictures that it was in, only the ones where it was almost directly overhead and at it's brightest turned out well enough to see anything. To get better pictures, particularly of the times it is lower on the horizon (which is the angle to best see the familiar "H" shape), I'd need a bigger telescope. Not so much for greater magnification, but for more light-collecting during the 1/1000 second shutter. From what I've read, an 8-inch aperture is recommended, and my Meade 102mm is the equivalent of 4 inches. Although its possible I could get some improvement with a different camera adapter. EDIT: something else that might help get a better view of the "H" shape is taking the pictures when it is in the East after sunset. The location I used doesn't have much of a view to the East, but in that direction the sunlight would be reflecting off the solar array things toward me. I'm still going through the other images, so if I find any more good ones I'll post them later. 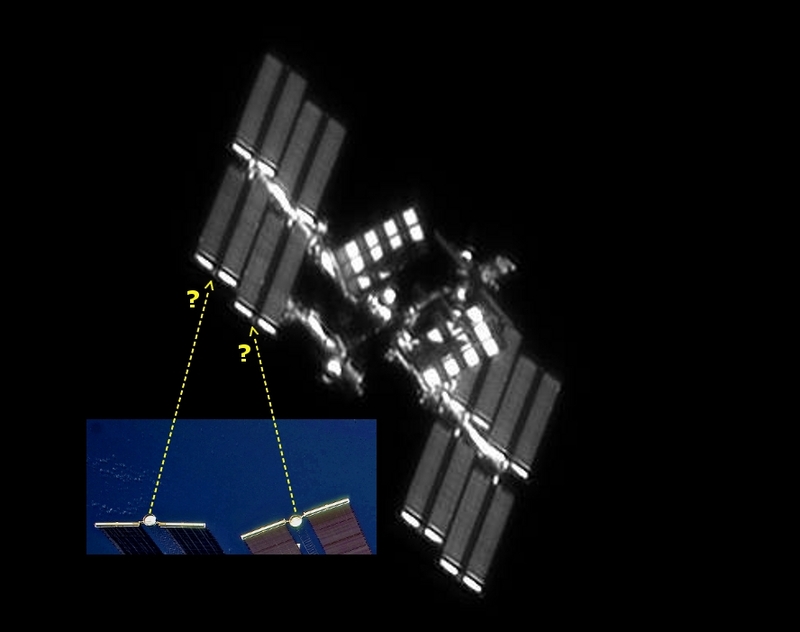 I applaud you for your valiant efforts in trying to snap the sharpest possible image of that (ever-changing & seemingly "shape-shifting") speck of light traversing our skies known as "the ISS" ( aka "the Thing", on this forum). I'll be eagerly awaiting your next set of pictures. Now, I'm sure you will understand my profound perplexity as to how these various amateur shots are so radically different - since they are meant to depict the very same spacecraft (although, of course, under different lighting / atmospheric conditions / photographic equipments - and whatnot). However, I won't dwell on this aspect right now - as I wish to share with you something which you may find even more interesting. As you will see, his images are truly incredible. You'd probably become depressed over the crude quality of your own shots of the "Thing". However, dear Notrap, do not despair - for I will now save you from banging your head on the wall while asking yourself: "Woah! WHAT exactly am I doing wrong? HOW does that Italian dude do it?" In other words, the VERY SHARPEST images available of "the THING" to be found on the internets (allegedly captured by a handful of "badass astrophotographers" around the world) are not to be trusted. What a surprise, eh ? He is (1) either on the NASA payroll - or (2) a lone, pathetic attention-seeker / photoshopper clown. However, if you have a third possible option / hypothesis to submit, please let me know. simonshack » November 30th, 2017, 4:30 pm wrote: Now, I'm sure you will understand my profound perplexity as to how these various amateur shots are so radically different - since they are meant to depict the very same spacecraft (although, of course, under different lighting / atmospheric conditions / photographic equipments - and whatnot). Not really, since the important aspect you are missing is different viewing angles and the fact that the "solar array" configuration varies to always be perpendicular to the sun. If every picture looked the same, the thing would have to be 2-dimensional. The things to consider when deciding if an image of it makes sense are the angle of view, direction of travel, and location of the sun. That sequence of photos I posted were obtained when it was passing through the maximum altitude of 66°, so the camera is looking at it from the side and almost directly underneath. The solar arrays would be oriented mostly be along the z-axis from this perspective and seen from the edge as opposed to the face. Photos of the approach are very dark and, individually, show little in the way of discernible features. This is of course due to the 102mm telescope aperture's limited light-collecting ability, the small amount of light allowed in during the 1/1000 second shutter, and the image noise resulting from the camera's high ISO setting. This is actually a very crude version of how most if not all hi-res pictures of it are made - by image stacking many hundreds, even thousands, of individual photos all taken taken within a short time to create a single image. It's also how those sharp full color images of planets like Jupiter and Saturn are produced. The first issue is the unavoidable shake from "mirror slap" part of the shutter mechanism that happens whenever the DSLR takes a photo. Some DSLR's feature an optional "mirror lock" function during still photos that eliminates this, but mine does not. The small vibration the shutter mechanism causes means every photo, particularly at this magnification, will be just a bit blurred, and this effect is magnified at very narrow fields of view. The only way to get a sharper picture would be to use a still faster shutter speed (which cuts the amount of light even further, leading to darker and possibly unresolvable images) or else to shoot in video mode. The main advantage to the video mode is the mirror is always up so there would be none of the vibration caused by the shutter, although video mode also means 2 megapixel resolution. The other issue was the camera adapter wasn't screwed in too tightly (something I didn't notice until about midway through the pass). This might be what caused the chromatic aberration effects seen in most of the shots. It was, after all, my first ever attempt at taking pictures of a fast-moving object through a telescope at high-magnification. All things considered, I think it may be worthwhile to attempt this again using the camera in video mode. Despite the lower resolution, I think it might produce better images since there will be no shutter vibration issues. According to what I read, the telescope was a Celestron C14HD ($5,700) that has a 14" aperture and a 3910mm focal length (350% more aperture and 650% more focal length than my scope). And instead of manually tracking a pass through a finder-scope, he used an obscenely expensive GM2000QCI "10 micron" mount (about $10,000) that automatically tracks it. The camera he used was a ASI290MM, which is a lightweight USB camera that has a frame-rate of up to 240fps and a much more down-to-earth cost of $400. Considering my scope and tripod came as a set and cost about $200, it's like comparing a Lamborghini to a VW Beetle. It's only a mild hobby for me, not an obsession and I've got better things to spend my money on. As for the unlit "white conjunction dish", I'm not sure why using NASA's CGI as a "real" picture somehow makes pictures taken from the ground fake. Seems like it should be the other way around: Ground-based imagery proves NASA close-ups are fake. But if we are to instead assume NASA's picture from space is legit... those little dishes look to be inset a bit, so in the ground-based photo the sun is probably not shining on the inside of it (and given that the arrays are oriented perpendicular to the sun, it shouldn't). You can also use another method called "afocal astrophotography" that mounts any kind of camera, even a "smartphone" camera in front of the telescope eyepiece. 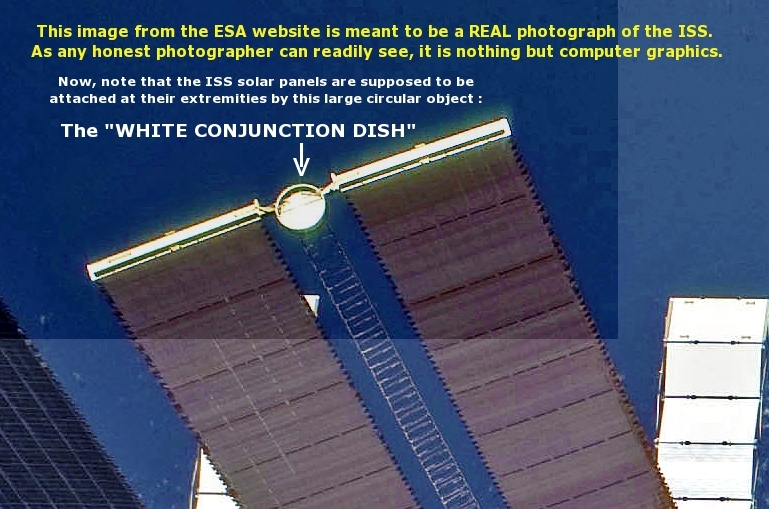 NotRappaport wrote: As for the unlit "white conjunction dish", I'm not sure why using NASA's CGI as a "real" picture somehow makes pictures taken from the ground fake. Seems like it should be the other way around: Ground-based imagery proves NASA close-ups are fake. Dear NotRap - the above comment of yours made me laugh heartily. I hope you meant it to be funny. NotRappaport wrote: But if we are to instead assume NASA's picture from space is legit... those little dishes look to be inset a bit, so in the ground-based photo the sun is probably not shining on the inside of it (and given that the arrays are oriented perpendicular to the sun, it shouldn't). I will probably have to travel some time next year and pay a visit to that Bianconi fellow - offering my logistical assistance for his next "ISS photo shoot". Now, would you not think that this pro-astrophotographer would be at least as well-equipped as our Bianconi amateur fellow? Perhaps he can't afford the top end equipment - and this would go to explain why his most 'spectacular' image of "the Thing" looks like this? Any idea why Vandebergh would publish such colorful, "xmas tree" images of the Thing - whereas Bianconi releases his images in greyscale? Oh wait, it must be due to that 'false color' issue that you mentioned - or perhaps because Vandebergh also forgot to screw on his camera adapter tightly enough, thus causing these chromatic aberrations? Or maybe it's a question of 'viewing angles'? "An October 2011 image he (Vandebergh) took of the 2.6-short-ton (2.4 t) defunct German telescope ROSAT was published by various media outlets, including the Washington Post, The New York Times and Fox News." < a flying air conditioner unit? 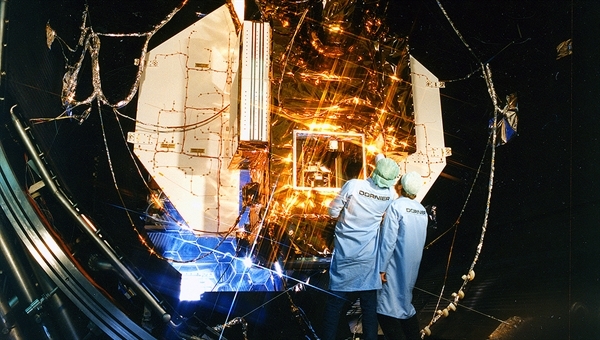 I'm afraid I cannot reconcile in any way, form or manner the above shape with that of the purported ROSAT satellite. Is it a question of viewing angles, maybe? Or could Vandenbergh have possibly have unwittingly pictured one of the million Near-Earth Asteroids circling around in our skies? "There are about 1 million near-Earth asteroids about 40 meters in diameter - of which about 1 percent have been discovered by 2015." Here's a graphic plotting the orbits of only 1400 such asteroids (the "Potentially Hazardous" ones). Imagine 1 million of them ! And some of them getting as close as THIS !!! And this is without accounting for the many meteor showers which occur regularly around the year. But of course, NONE of them ever ram into any of our precious and costly artificial satellites (which provide our all-important television signals, GPS, 'global warming' data) - or gawd forbid - into our manned Space Station(s). simonshack » December 1st, 2017, 2:18 am wrote: Any idea why Vandebergh would publish such colorful, "xmas tree" images of the Thing - whereas Bianconi releases his images in greyscale? Perhaps he wanted a color image? It comes at the cost of reduced sharpness because monochrome cameras produces sharper astrophotography images. See https://photographingspace.com/colour-vs-mono-camera/ for a detailed explanation of this phenomenon. In the case of the Bianconi pics, it was disclosed that he used a ASI290MM camera, which is monochrome. I found these in about 5 seconds on Google Images. Maybe they are blocked in Italy? 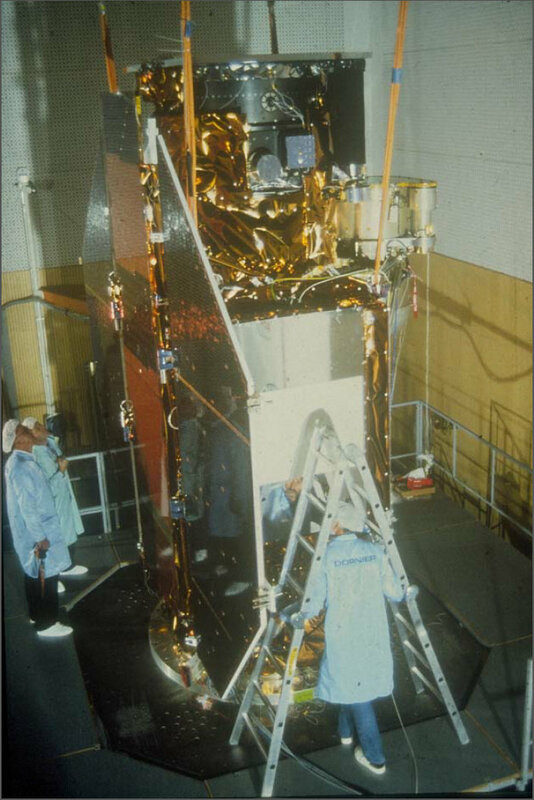 simonshack » December 1st, 2017, 2:18 am wrote: I'm afraid I cannot reconcile in any way, form or manner the above shape with that of the purported ROSAT satellite. Is it a question of viewing angles, maybe? That photo is way too blotchy for me to reconcile it either. 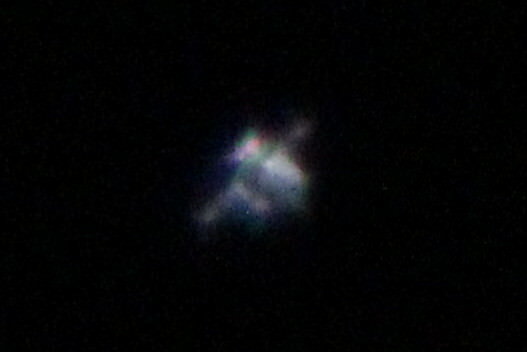 I never heard of the ROSAT before today, but since it was only a tiny fraction of the size of the "ISS", and further away, it would never be seen as more than a tiny moving point (maybe 2 arcsecond in size?). 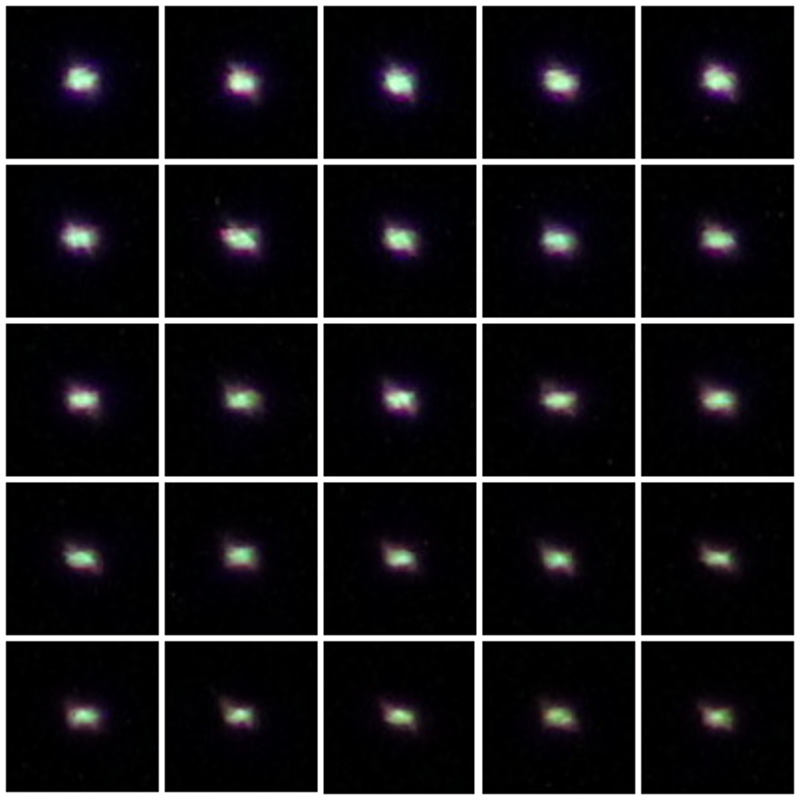 I think it's more likely he interpreted the random distortions in its point-like shape (caused by atmospheric refraction, camera jiggle) as corresponding to the appearance of ROSAT when viewed from some unknown angle. simonshack » December 1st, 2017, 2:18 am wrote: Or could Vandenbergh have possibly have unwittingly pictured one of the million Near-Earth Asteroids circling around in our skies? 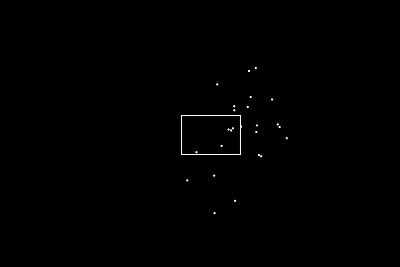 Based on apparent motion it would be impossible to mistake an asteroid for something orbiting much closer than any asteroid passes, so the object photographed was probably ROSAT, but the perceived shape and implied viewing angle is most probably illusory because the orientation was unknown and the size only a couple of pixels. simonshack » December 1st, 2017, 2:18 am wrote: Imagine 1 million of them ! And some of them getting as close as THIS !!! ^ Which is as close as 43,000 km. That's far beyond even geostationary orbit range. According to Official sources, they sometimes do ram into them: https://www.nasa.gov/centers/wstf/labor ... /mmod.html. 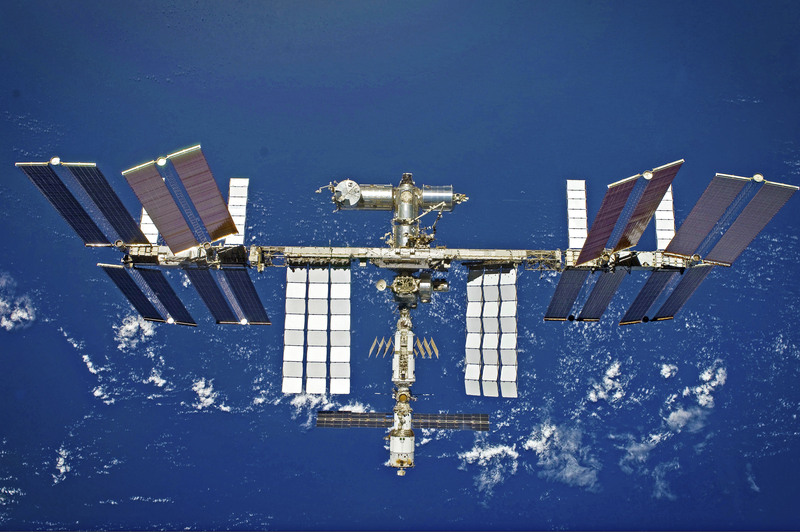 This is one of the main reasons I do not believe the ISS is actually pressurized or occupied. An empty husk with engines can withstand the odd puncture from micrometeorites without it being noticeable from ground observations. Whereas an occupied vessel would suffer catastrophic decompression from such events. simonshack » December 1st, 2017, 2:18 am wrote: or gawd forbid - into our manned Space Station(s). "Manned"? You crack me up! NotRappaport wrote: In the case of the Bianconi pics, it was disclosed that he used a ASI290MM camera, which is monochrome. NotRappaport wrote: (...)those little dishes look to be inset a bit, so in the ground-based photo the sun is probably not shining on the inside of it (and given that the arrays are oriented perpendicular to the sun, it shouldn't). "Little" dishes?.. "Oriented perpendicular to the sun?" Well, excuse me dear Notrap, but I think you are - as they say over in the US of A, "full of it". Since you pretend not to grasp what I'm talking about, I'm gradually getting the feeling that you are pulling my leg - a very unpleasant feeling indeed. The array edges (i.e. 1,2,3, and 4) are clearly NOT perpendicular to the sun, as they are brightly illuminated - and so should, obviously, the dishes be. In the Bianconi images, those little big dishes are simply NOT THERE. Get it? NotRappaport wrote: ^ Which is as close as 43,000 km. That's far beyond even geostationary orbit range. What's your point? That all these "Potentially Hazardous Near Earth Objects" are nicely keeping clear of the ca. 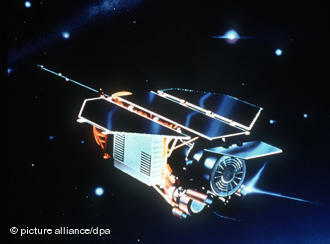 36,000km altitude of the so-called geostationary satellites - so as to respect our earthly lifestyles? Whereas ALL meteors that enter our atmosphere (and promptly burn up) do so at about 50-100 km of altitude? Is there, for some reason, an "asteroid-free zone" between 50 and 43,000 km? Besides, if you'd only spent 5 minutes researching them, you would know that several officially-reported NEO's have passed considerably closer than 43,000km. Who knows just how many? Are we to trust NASA to inform us about it? Would it be unreasonable to posit (as I do) that many thousands of asteroids populate our ionosphere (i.e. within 1000 km of altitude or so) - and that THESE are those countless specks of light that we can see at night moving briskly against the starry background? (As a kid, I used to see one of those every 5-10 minutes or so - as I stargazed for hours under the crystal-clear Norwegian skies before falling asleep on the lawn of my grandfather's house in the summertimes. Surely, they weren't man-made satellites!). Notrap, I'm not sure about what you are trying to do here - but I am starting to have an inkling about it. You do seem to believe that man-made machines are orbiting earth in "free-fall" at hypersonic speeds - no fuel needed, for years / decades on end - thanks to the inertia given to them by a rocket launch. However, since I am curious to see what sort of imagery you will be offering of the "THING" (as you improve your astrophotography skills), I will be patiently waiting for it. The little white "X" in the middle of California is my viewing location. 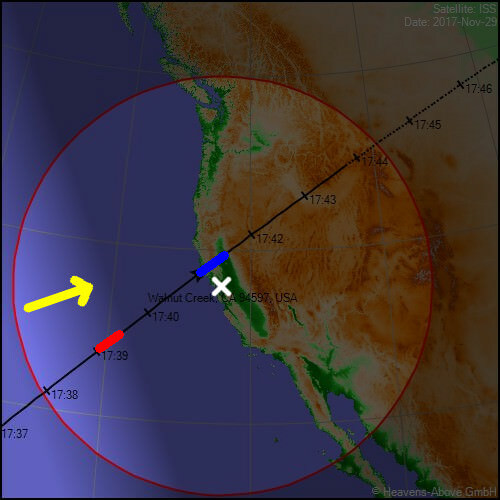 The black line with time markers is the ISS path (moving from South-West to North-East). The part of that path that is red is when I captured the images that are very dim and which faintly show the "H" shape. The part of the path that is blue is when I captured the brighter images (including the best one that we will examine further). The yellow arrow is the direction from which sunlight is coming (at this time for my location the sun is about 10° below the horizon). The shaded area is approximately where the sun's terminator line would be. 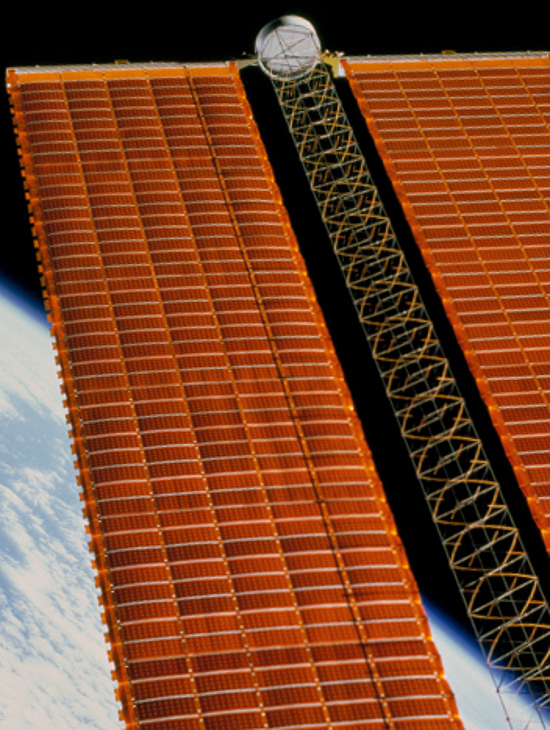 To see what the ISS would look like from this angle of view, we can use the "ISS Interactive 3D Visualization" http://heavens-above.com/ISS_3D.aspx and look at a time when the ISS is just passing the sun's terminator line going from light to dark, and rotate the view to be looking at it from underneath at an angle of 66° and to the side. Hope this helps. 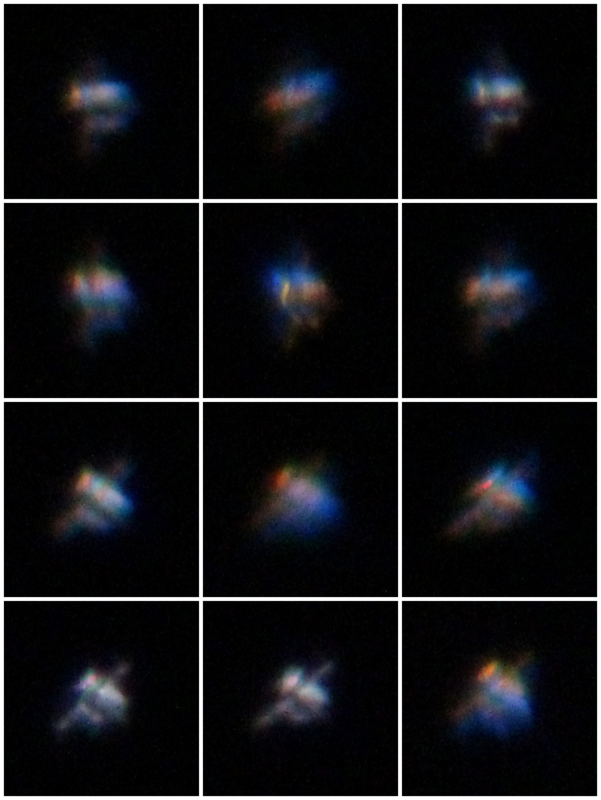 And I strongly suggest that folks try to engage in more hands-on, outside, "away from keyboard" research and work at getting their own pictures of the "ISS" thing. Many people have already done this and it is not that difficult to do. 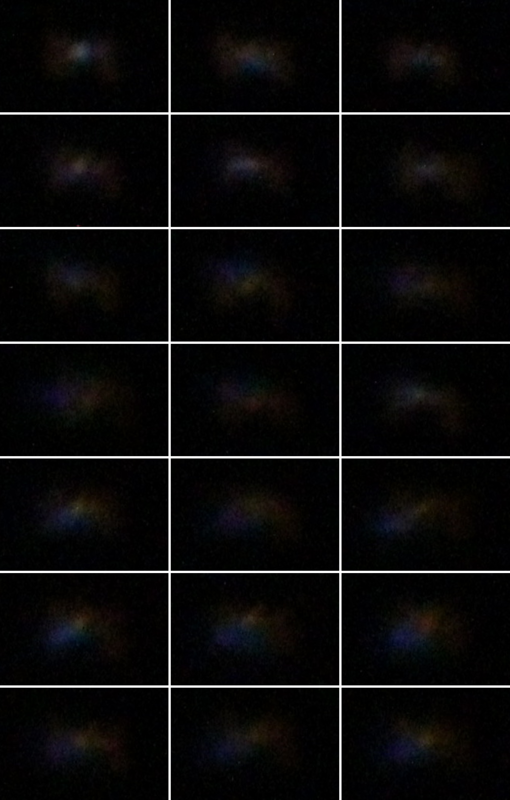 Find out for yourself using a setup like I have described or try "afocal astrophotography" (you can use almost any type of camera for this, even camera-phones). simonshack » December 1st, 2017, 5:15 pm wrote: Notrap, I'm not sure about what you are trying to do here - but I am starting to have an inkling about it. You do seem to believe that man-made machines are orbiting earth in "free-fall" at hypersonic speeds - no fuel needed, for years / decades on end - thanks to the inertia given to them by a rocket launch. If you wish to speculate on my "beliefs" and question my motives, that's your prerogative. I'm not really sure what the paranoia is about and I've already said multiple times in this thread that the thing needs fuel and fires its engines to maintain the altitude, but for some reason you ignore that. My interest is in finding out what is true by engaging in research and logical debate, not in stroking egos. Maybe you dislike being shown you are wrong about something and that's where this hostility is coming from? So while you are having "inklings" about me, I am beginning to have inklings about you as well based on your conduct. If that is more than you can handle and you feel the need to ban me to avoid this criticism, que sera, sera. Maybe my inklings are wrong - but we will soon know. There are very good reasons to doubt the thing is really a "space station", but there are no good reasons at all to doubt the thing is really up there and can be photographed.